19 cm tall (8 inches). 17.5 cm long. 8 cm width. 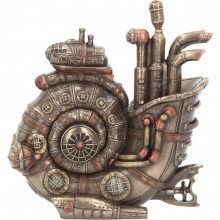 Very detailed collectable figurine showing a steampunk ammonite sea machine. The middle part can be removed for a very small storage space, perhaps for a ring or necklace of importance. It is not obvious so a good hiding place. Solid Cold cast bronze resin for a heavyweight display piece.